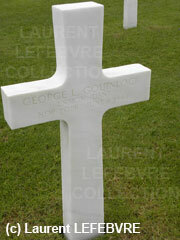 OMAHA BEACH MEMORIAL - GOUINLOCK GEORGE L, N.C.D.U. Is there anyone who can post a picture of his grave. My mother, Dorothy Gouinlock Booher (age 87), is his cousin. He means a great deal to his family. We are proud of his sacrifice and will always remember him. Thank you!